One More from "One Man Thousand"
....Alex Konadu was born in 1950 at Adwumakase Kese in the Kwabere No.3 District of Ashanti. Konadu started singing at an early age, and became the leader of the Kantamanto Bosco Group before moving on to the band of the well-known Kwabena Akwaboah. He honed his artistic skills there after three years moved to the Happy Brothers Band. After two years Kwabena went 'solo' for some time, composing and practicing until he invited Mr. A.K.Brobbey -record dealer and producer- to listen to his rehearsals and he got signed and Brobbey organised a band. With their new, very uptempo guitar Highlife they had instant succes. His ability to draw crowds wherever he went gave Konadu the appellation "One Man Thousand." Withstanding the vicissitudes of fame and fashion, and staying true to his vision of pure, unadulterated highlife music, he became an inspiration to Ghanaian musicians for years. While Konadu issued many wonderful recordings over the decades, Asaase Asa is still considered one of his most noteworthy achievements. 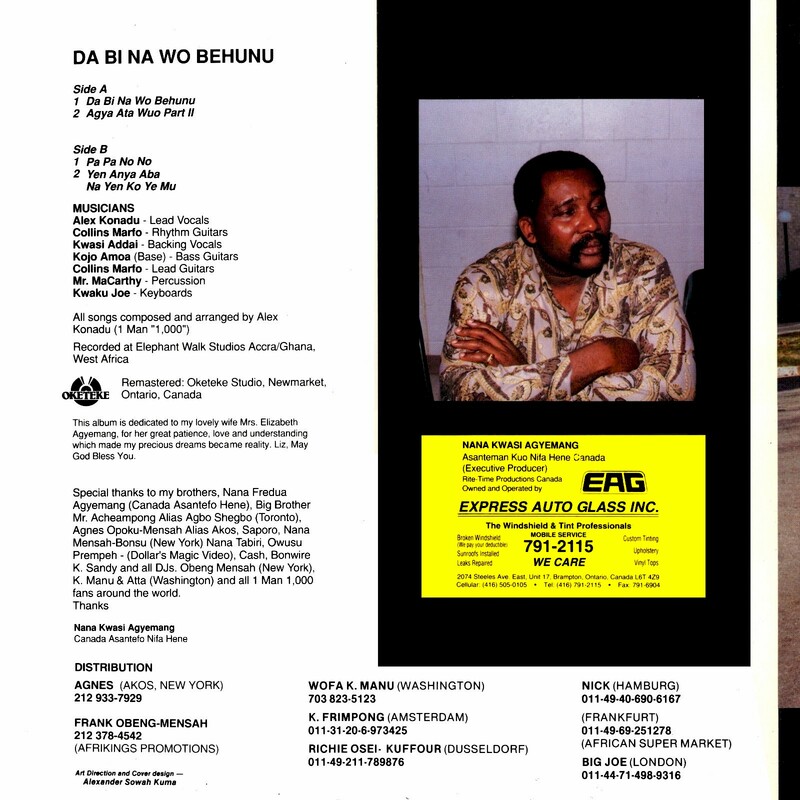 Today I present an Alex Konadu record that I haven't seen on any of the other African music sites, recorded during a Canadian sojourn - 1992's Da Bi Wo Behunu (BlackSounds RTLP 003). This is classic Konadu - Ghana highlife stripped down to its propulsive, infectious essentials. Enjoy! Download Da Bi Wo Behunu as a zipped file here. 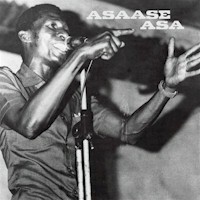 The 1976 album Asaase Asa (Brobisco KBL 016) was a breakthrough hit for Alex Konadu, establishing him as Ghana's foremost exponent of "roots highlife." The title song is based on a true story about Mr. Asaase Asa, who lost both his wife and sister when they were killed by a falling tree. It is dedicated to all who have lost their loved ones. Konadu had been singing since an early age, and became a leader of the Kantamanto Bosco Group before moving on to the band of the well-known Kwabena Akwaboah for three years and then to the Happy Brothers Band. After going solo he was discovered by the producer A.K. Brobbey and the rest, as they say, is history. His ability to draw crowds wherever he goes has given Konadu the appellation "One Man Thousand." Withstanding the vicissitudes of fame and fashion, and staying true to his vision of pure, unadulterated highlife music, he has been an inspiration to Ghanaian musicians for years. While Konadu has issued many wonderful recordings over the decades, Asaase Asa is still considered one of his most noteworthy achievements. Enjoy! Download Asaase Asa as a zipped file here. 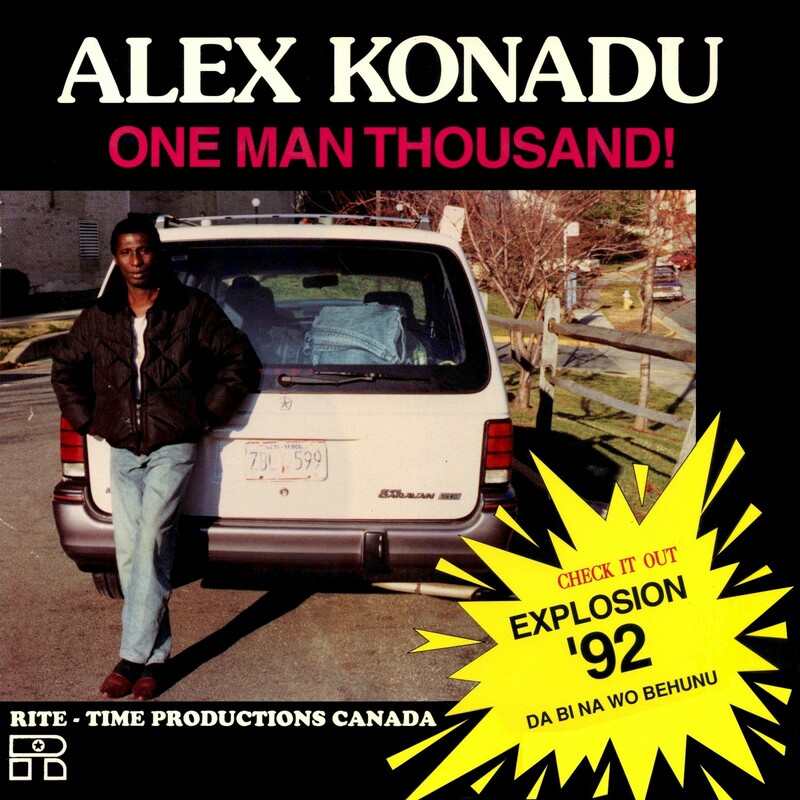 For a taste of Alex Konadu recorded before a live audience, be sure to check out his album One Man Thousand Live in London.